Low impact development or LID is a philosophy of stormwater management that aims to mimic natural processes in order to control runoff and protect water quality. LID practices are typically highly localized and distributed throughout a watershed by both residential homeowners and municipalities. A collaborative project, led by John McMaine, between South Dakota State University Extension and Dakota Rural Action sought to engage homeowners across eastern South Dakota in green infrastructure education and collaborate with citizens to construct a residential rain garden in Sioux Falls. Together, SDSU Extension and Dakota Rural Action hosted a series of rain garden workshops in Brookings, Sioux Falls and Watertown, helped facilitate the construction of a rain garden, and provided guidance on monitoring the rain garden’s hydrology and water quality moving forward. The rain garden the team constructed in Sioux Falls. During the workshop, participants created their own rain garden designs for a site in Sioux Falls and presented their designs to the group. They were also invited to participate in both the construction of the rain garden and a post-construction rain garden tour. With the help of participants, the rain garden was constructed in the spring of 2018 and will be monitored during the spring, summer, and fall of 2019 and a follow-up tour is planned following monitoring to demonstrate the impact of the garden. Since examples of functional rain gardens are scarce in South Dakota, the rain garden will also be used for research moving forward. The rain garden is split into two cells with biochar incorporated into the in-situ soil of one cell and no biochar in the other cell to allow hydrologic and water quality performance comparison between the two cells. In addition, an underdrain was installed with the flexibility for it to function as a conventional underdrain for one cell and without an underdrain for the other. The research team is also tracking the plant survival for efficacy of different pollinator plant species in rain garden systems in eastern South Dakota. In total, the workshops and tour reached over 55 individuals in eastern South Dakota. 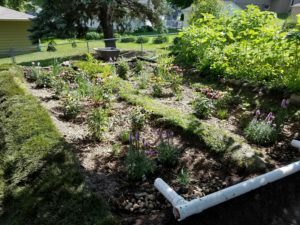 According to John McMaine who helped led the project, the garden not only engaged citizens who can take the knowledge they learned back to their communities, but it will also help answer questions about rain garden effectiveness in South Dakota. 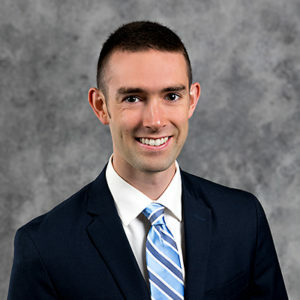 Dr. John McMaine is an assistant professor and extension water management engineer in the Agricultural and Biosystems Engineering department at South Dakota State University. He received his PhD in Biosystems Engineering from Oklahoma State University. He received BS and MS degrees in Biosystems and Agricultural Engineering from the University of Kentucky. His research and outreach interests center around agricultural and urban water management, water quality, and contaminant transport and fate. In his current role, he researches water management technologies that are environmentally and economically sustainable and provides guidance for South Dakotans to implement water management technology.